Based on water quality monitoring results at the Chemours plant, state environmental regulators announced today it won’t suspend the company’s wastewater discharge permit into the Cape Fear River. However, the permit renewal is still under review, and the state could still revoke the permit should the company again release perfluorinated compounds such as GenX and Nafion into the drinking water supply. On Sept. 5, NC Department of Environmental Quality put the company on a 60-day notice that it would suspend the permit if the company failed to stop releasing fluorinated compounds into the Cape River and meet the state’s other demands. 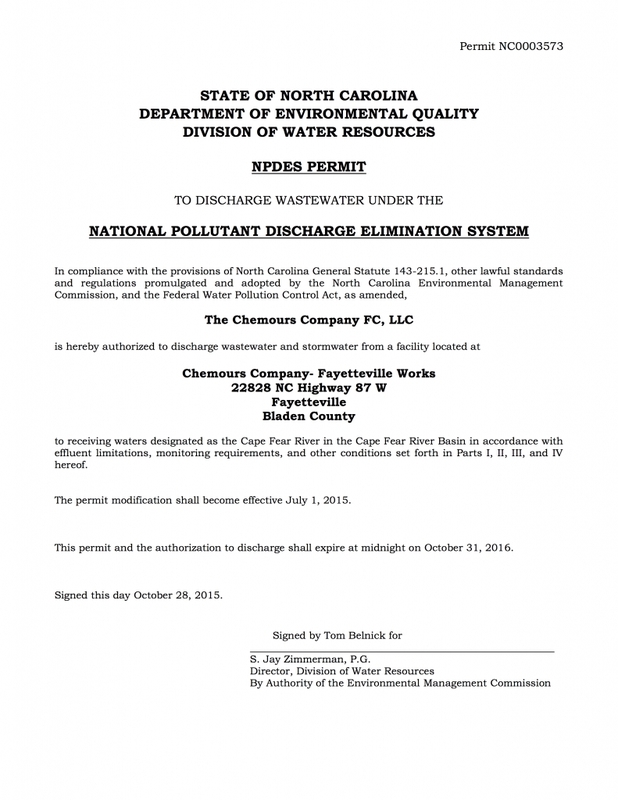 A Bladen County court issued a partial consent order that required Chemours to stop the discharge of GenX and Nafion byproducts from the facility. The state based its decision on its review of Chemours’s water quality monitoring results, which show that the company is meeting regulators’ demands. But the company’s legal problems continue. Today, the national law firm of Cohen Milstein Sellers & Toll, which has offices in Raleigh, filed class-action litigation against Chemours and DuPont for contaminating the drinking water of thousands of residents downstream. The suit was filed in the US District Court, Eastern District, Southern Division. Victoria Carey of Leland claims her drinking water recently was tested and found to have elevated levels of GenX and Nafion. According to WWAY, Carey says she has had several medical issues she has dealt with since moving to the area are a result of GenX contamination. In addition to a financial award, which could total in the billions of dollars, attorneys want a federal court to order DuPont and Chemours to establish medical monitoring to provide health care and other appropriate services to the plaintiffs in the suit. Ouch – this is not going to end well for Cooper. After Cooper deftly signed a sweetheart deal with Chemours in the dark of night one Friday evening to avoid Citizen suits in federal court (although CFPUA still filed – they have been blocked by this midnight deal) these pesky trial lawyers have filed lawsuits (outside the Clean Water Act). This means discovery – this means embarrassment and maybe worse. I am confident that the Progressive pulse will come around and recognize what has been going on and focus its protection on the environment.